The remake of the old Beauty And The Beast TV Show looks less and less interesting by the minute. 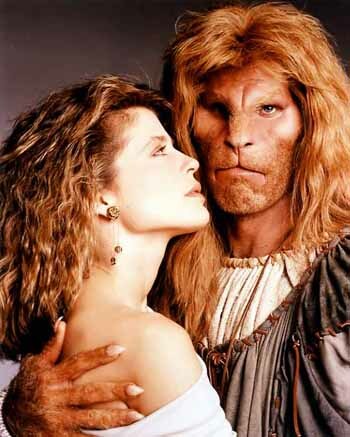 First airing in 1987 and running till 1990 the original show told the story of a woman (Linda Hamilton) who is saved by a mysterious animal-like man named Vincent (Linda Hamilton) that she befriends. The original series was gutsy in that Vincent was deformed. He really looked like a monster. But thanks to his lion-like appearance and the superb acting of Ron Perlman he became likeable. In the new series they decided modern audiences wouldn't like someone with physical disabilities so they made him have a big scar down one side of his face. So he's stunningly handsome from one side, but slightly ugly from the other. 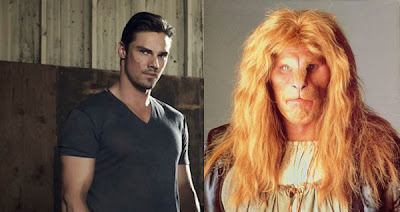 According to the actor Jay Ryan the Beauty and the Beast make-up is gradual. "There's a mix of CGI and prosthetics in the pilot." Ryan said. "But as the series continues, his transformation will become larger, I think, as the chemical takes over his body." It's a nice compromise, but takes away the whole message of the show, and the original fairy tale, that beauty can be found inside.It's always possible they're going to introduce us to his "fugliness" gradually throughout the series. "The backstory of our beast, ours is different," Ryan said. "Ours is about this internal demon inside him, which is chemical and comes out. For me, it's not about what he looks like. That's just a sidebar to it. It's about how a human behaves. And how his mind is like this tangled mess of noble and savage impulses." Here's the synopsis of the new Beauty and the Beast. Detective Catherine Chandler is a smart, no-nonsense homicide detective. 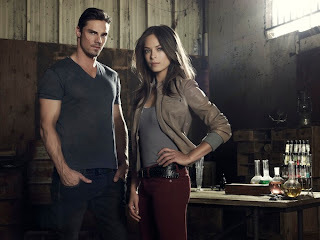 Several years earlier, Catherine (Kristen Kreuk) witnessed the murder of her mother at the hands of two gunmen. Catherine would have been killed too, but someone – or something – saved her. No one has ever believed her, but she knows it wasn’t an animal that attacked the assassins…it was human. Years have passed, and Catherine is a strong, confident, capable police officer, working alongside her equally talented partner, Tess. While investigating a murder, Catherine discovers a clue that leads her to a handsome doctor named Vincent Keller, who was reportedly killed by enemy fire while serving in Afghanistan in 2002. Catherine learns that Vincent is actually still alive and that it was he who saved her many years before. For mysterious reasons that have forced him to live outside of traditional society, Vincent has been in hiding for the past 10 years to guard his secret – when he is enraged, he becomes a terrifying beast, unable to control his super-strength and heightened senses. Catherine agrees to protect his identity in return for any insight he may have into her mother’s murder. Thus begins a complex relationship between Catherine and Vincent, who are powerfully drawn to each other yet understand that their connection is extremely dangerous for both of them. Here's the original Catherine and Vincent. Here's the trailer which shows a little of his "beast-like" characteristics. Beauty and the Beast premieres Thursday, Oct. 11 at 9/8c on the CW. What do you think of the new Beauty and the Beast? 5 Most Surprisingly Touching Moments on "Futurama"
I am interested in seeing this - I will hold out faith that this won't be lame.... I hope. I don't see any need to remake the show. So in this one he's basically the Incredible Hulk? Sounds lame. Kristin is a wonderful actress and very sweet. She almost made Street Fighter worth watching. I do too Natasha, but I hope this isn't another remake like Bionic Woman. Getting rid of what made the original great and adding weaker elements. I can't think of anything either but how many remember the original? Pat, I guess so. Please don't make him moody. You wouldn't like him when he's moody. I read the critics hated this show. Which may make it a hit. I'm not interested. A tiny scar hardly makes him a beast. THAT'S funny, Maurice! Nice one! I saw a couple of episodes of the original, not a fan by any means - but this looks quite terrible. boo... hiss... boo hiss. i will not be watching it or enjoying it, though Kristen is the cat's meow. i say no way.. that film was gravel. the poster was the start of it's problem... then add a water script. The show had a really low start. By the end of ep 4 i got more interested. But since ep 14 things went crazy. Episodes 16, 17 18 were pure craziness. Im totally hooked with the tv show. Worth watching if u give it a chance. This show hasn't gotten better, it's gotten worse. It's NOT worth watching in the least, they even scraped the original SL because it simply didn't work. Someone else already wrote it best, this dude's the hulk only not remotely intimidating. The original Vincent was actually good-looking, this guy just looks like a girl.